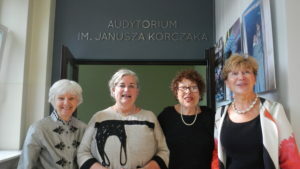 Joyce Reilly, Marcia Talmage Schneider, Efrat Efron, Tatyana Tsyrulina, and Mariola Strahlberg attended a very special congress/conference at the Polin Museum of the History of Polish Jews in Warsaw, Poland, September 13-16, 2017. Mariola Strahlberg presented a paper about Shining Mountain’s Enrichment Program at the International Korczak Association Conference on September 15, 2017 in Warsaw, Poland entitled: “Enriching Lives of Immigrant Children in the Spirit of Janusz Korczak”. Click here to read the article. 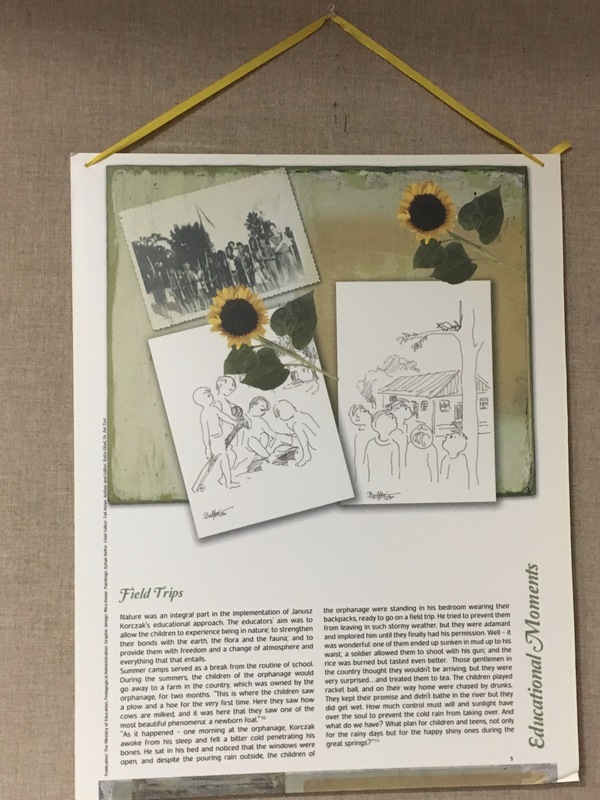 Exhibit of 14 posters, depicting Life and Work of Dr. Janusz Korczak, was on view at the Finkelstein Library in Spring Valley, NY, June 12 – August 24, 2017. Mariola Strahlberg gave a talk about Dr. Korczak and his pedagogical ideas that very needed in our times. She was joined by Irving Roth, a Holocaust survivor from Slovakia, who has been teaching young and old about Holocaust for the past 30 years. 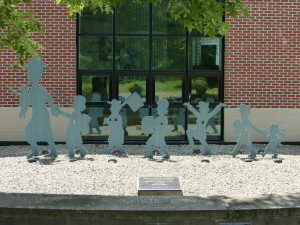 Irving developed a unique program “Adopt a Survivor” and heads the Holocaust Center of Temple Judea of Manhasset, Long Island, NY, where a large part of the exhibit is dedicated to Janusz Korczak, and a 7′ by 20′ sculpture of “The Last Journey”, designed by Irving, is standing proudly in front of the Holocaust Center. In 2017, three scaled down model Menorahs have been fabricated by renowned Judaic artist, Gary Rosenthal. You can order one of the menorahs from the Jewish Gift Place. 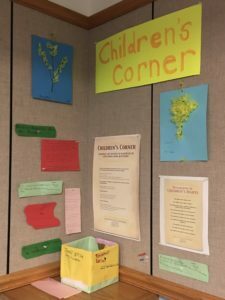 From September 2016 to May 2017, we ran our after school Enrichment program, in the spirit of Janusz Korczak, for children pre-K through middle school. The program provides reading and math skill enhancements, arts and crafts, culture, educational games, movement etc. Currently, we are up to 10 regular volunteers, and have received many wonderful donations of school supplies, books, art supplies, and educational games. 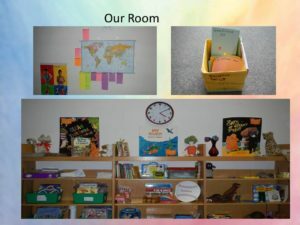 Each day the children can’t wait to come up to our room, which is warm and inviting and filled with such beautiful materials. We also provide healthy snacks that the volunteers do on their own, because we noticed in the beginning that many of the children were hungry. Some favorite activities are finger knitting, lacing, pick up sticks, checkers, connect 4, dominos, blocks, and, of course, each week we have an art or cultural project based on a holiday or season. Some favorites were gingerbread men, Chinese lanterns, cutout snowflakes, bath salts, Ukranian Pysanky egg decorating. 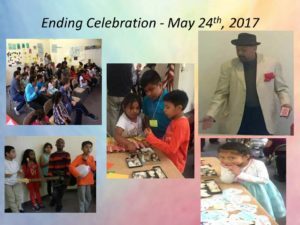 The program ended with a beautiful celebration on May 24th for the children, their parents, library staff, and Shining Mountain volunteers. We were honored by the visit from two Rockland County officials, honorable Ed Day and Alden Wolfe. Children delighted in the musical entertainment with Paul Finbow and a magic show with Cesare Ciaglo. 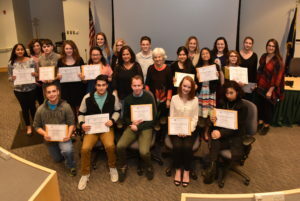 On May 9, 2017, Mariola Strahlberg was invited to give a keynote address at the Siegelbaum Competition Award Ceremony at the Rockland County’s Holocaust Center honoring the outstanding art and literary submission by this year’s 15 competition winners. 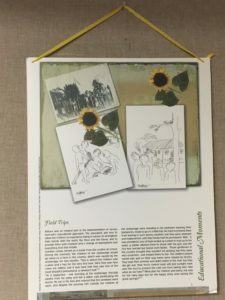 The 2017 competition’s theme was “The Power of the Immigrant Story”. Over 170 students from 30 NY/NJ middle schools and high schools participated in the event. Our Korczak Program in the Mahwah Polish School ended in April 2017 with two sessions for high school students and 4th – 5th graders. At the lower school, Mariola used Blumka’s Diary (Pamiętnik Blumki). Children chose one orphan from the book and wrote letters to them after learning the story about each orphan. 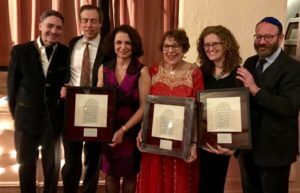 On February 4, 2017, Marcia was honored at her synagogue, Ansche Hesed on Upper Westside of Manhattan, where she has been an active member for 24 years. 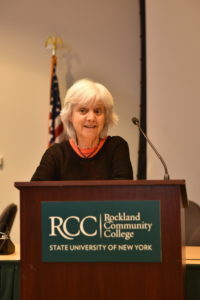 She taught Hebrew reading to adults for several years, co-chaired education committee, was involved in the summer program of “Scribblers on the Roof” where authors gave book talks and read from their new works, and together with her husband volunteered at the Homeless Shelter housed at the synagogue. But her claim to fame is that she is the “Sticker Lady”: she is handing out stickers, she buys in Israel, to children who attend the services. The children are delighted, and it almost seems that they grow a few inches with happiness from this. Marcia loves children, just as Korczak. In her speech, she said: “I wrote my book, Janusz Korczak: Sculptor of Children’s Souls, in the hope that we can all learn from Korczak’s magical humanism and fulfill his dream of making a BETTER WORLD with LOVE AND RESPECT by being true Ansche Chesed, pursuers of truth and justice”. 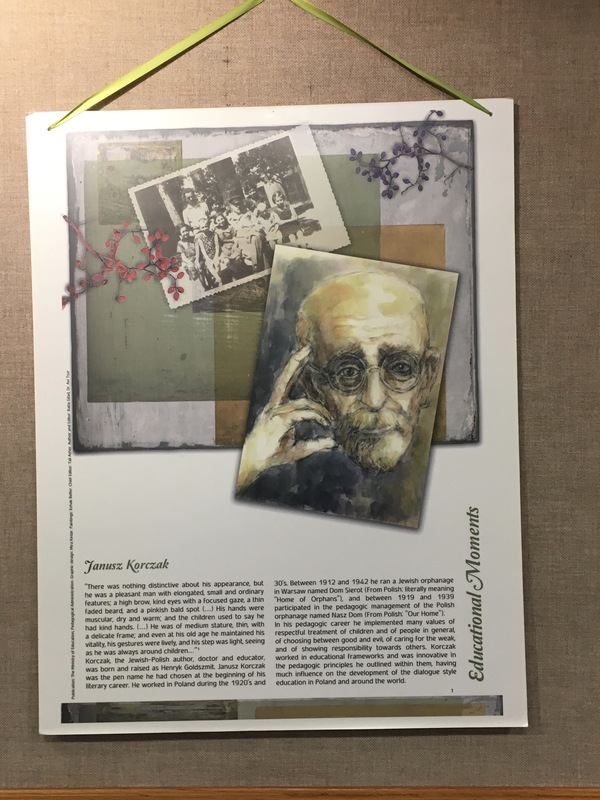 Dr. Bomze presented Korczak’s life and teachings to principals of the Education Council of Jewish Schools in the Greater Palm Beaches. According to the Senior Director, Lynn Lieberman, the talks inspired the educators to develop programs for their schools. 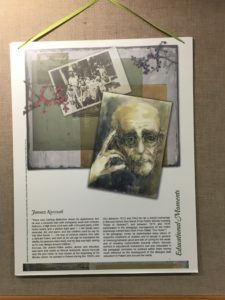 He also showed Wajda’s film “Korczak” in its entirety to an audience attending the Academy for Continuing Education at the JCC in Boynton Beach. This program included pre- and post-film discussions. 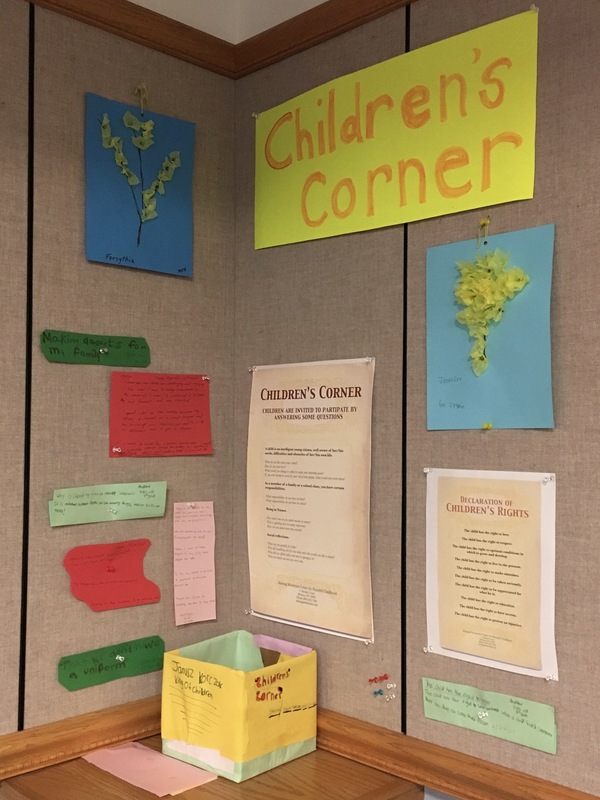 At the Baldwin Prep, a charter school in North Palm Beach, Dr. Bomze and his wife, Nadine, did a program with reading to the children a story about Janusz Korczak, discussing children’s rights, and then making kites, that were decorated with each child’s favorite rights. 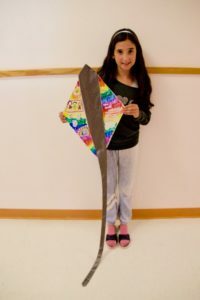 Under the direction of Eileen Shapiro, the former director of Holocaust education of the Palm Beach School System, the pupils were able to fly the kites in the courtyard.